The Control Data Corporation (CDC) 6600 performs up to 3 million instructions per second —three times faster than that of its closest competitor, the IBM 7030 supercomputer. The 6600 retained the distinction of being the fastest computer in the world until surpassed by its successor, the CDC 7600, in 1968. Part of the speed came from the computer´s design, which used 10 small computers, known as peripheral processing units, to offload the workload from the central processor. The Canadian Chalk River Nuclear Lab needed a special device to monitor a reactor. Instead of designing a custom controller, two young engineers from Digital Equipment Corporation (DEC) -- Gordon Bell and Edson de Castro -- do something unusual: they develop a small, general purpose computer and program it to do the job. A later version of that machine became the PDP-8, the first commercially successful minicomputer. 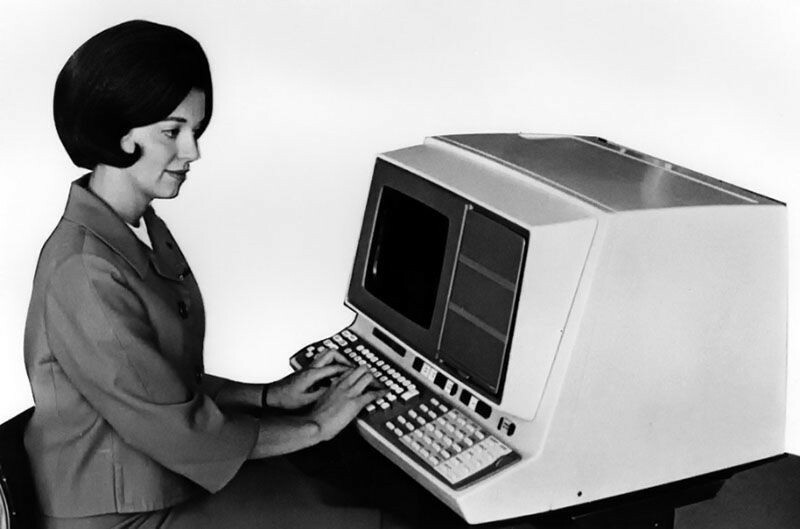 The PDP-8 sold for $18,000, one-fifth the price of a small IBM System/360 mainframe. 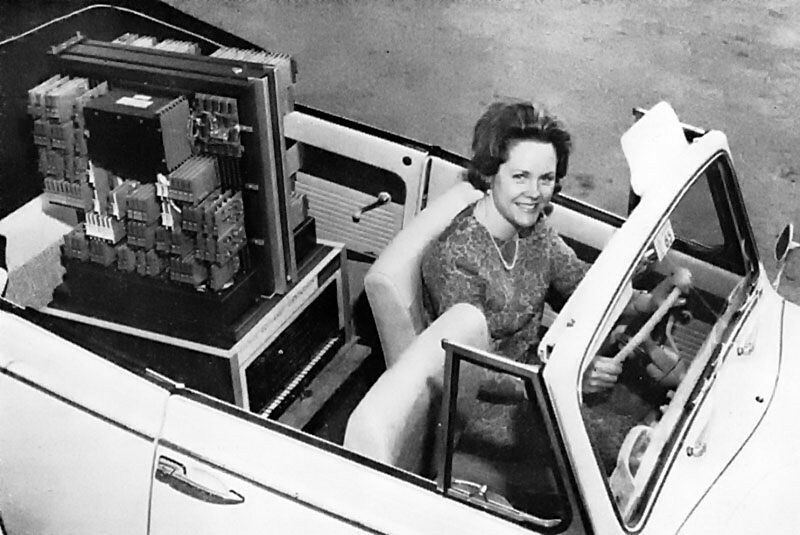 Because of its speed, small size, and reasonable cost, the PDP-8 was sold by the thousands to manufacturing plants, small businesses, and scientific laboratories around the world. IBM's 2315 disk cartridge is announced. This 1MB disk cartridge was used with the IBM 1800 and 1130 computers, and it provided easily transported “personal storage” for users of those small computers. Each 2315 consisted of a magnetically coated, direct access disk encased in a plastic cartridge that easily fit into built-in disk drives. When it was inserted into the disk drive, a power drive engaged the disk and spun it at 1,500 revolutions per minute. Simultaneously, an arm extended to perform read and write functions on the disk's magnetic surfaces. Seven years in the making, IBM’s 2321 Data Cell Drive stored up to 400 MB. 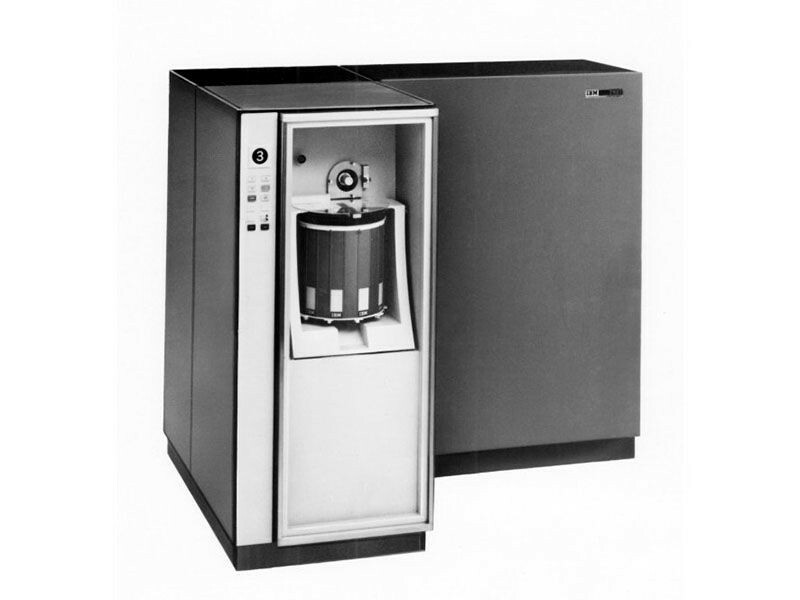 The Data Cell Drive was announced with the System/360 mainframe computer. Wide magnetic strips were plucked from bins and wrapped around a rotating cylinder for reading and writing. Reliability problems plagued the initial models, but after improvements were made it became relatively reliable and sold until 1976. 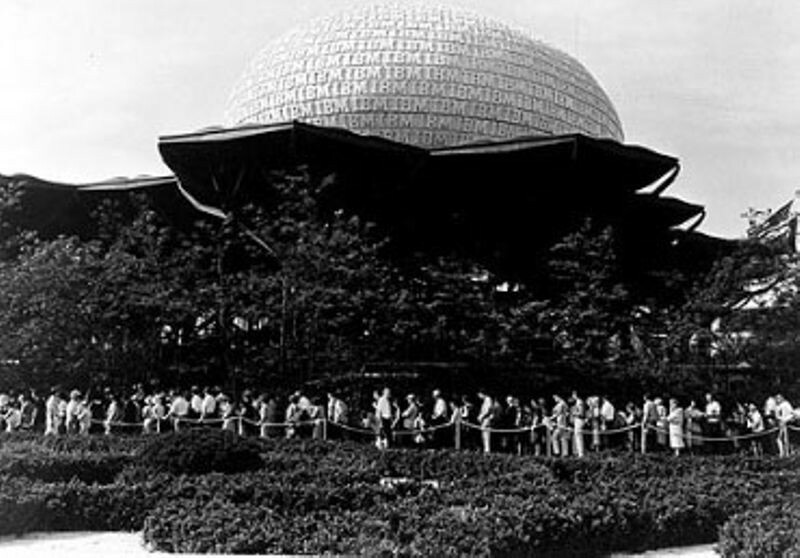 The New York World's Fair of 1964 features demonstrations from governments and companies from around the world. IBM hired architect Eero Saarinen to design a major pavilion, featuring the Information Machine, an attraction and film designed by noted filmmakers Charles and Ray Eames. 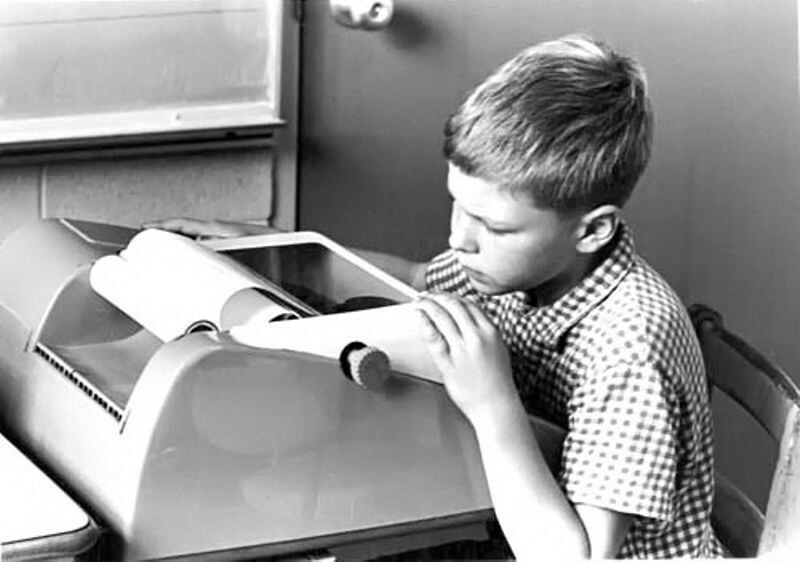 The pavilion featured demonstrations of IBM products such as the newly released IBM Selectric typewriter, machine translation and the IBM 1460, which demonstrated handwriting recognition and on-line information retrieval. System/360 is a major event in the history of computing. On April 7, IBM announced five models of System/360, spanning a 50-to-1 performance range. At the same press conference, IBM also announced 40 completely new peripherals for the new family. System/360 was aimed at both business and scientific customers and all models could run the same software, largely without modification. IBM’s initial investment of $5 billion was quickly returned as orders for the system climbed to 1,000 per month within two years. 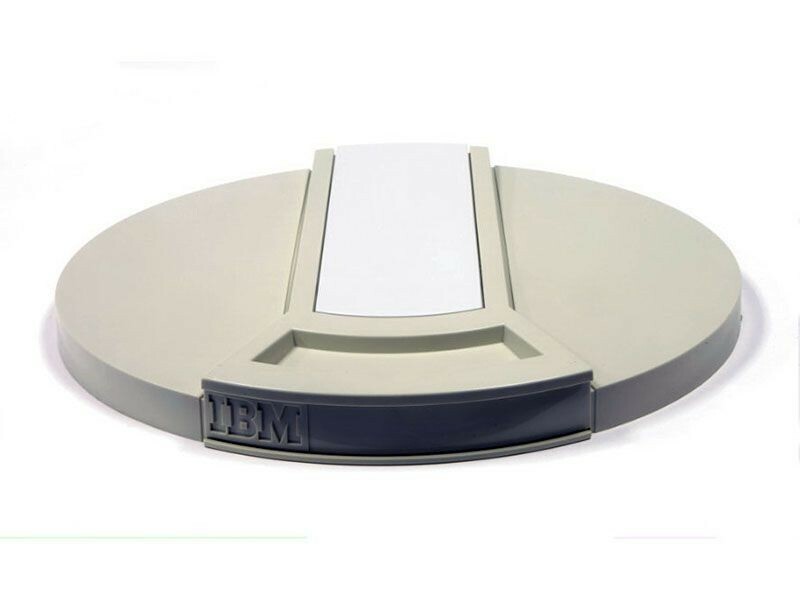 At the time IBM released the System/360, the company had just made the transition from discrete transistors to integrated circuits, and its major source of revenue began to move from punched card equipment to electronic computer systems. IBM introduces the SABRE reservation system for American Airlines. First tested in 1960, the system took over American’s reservations four years later. 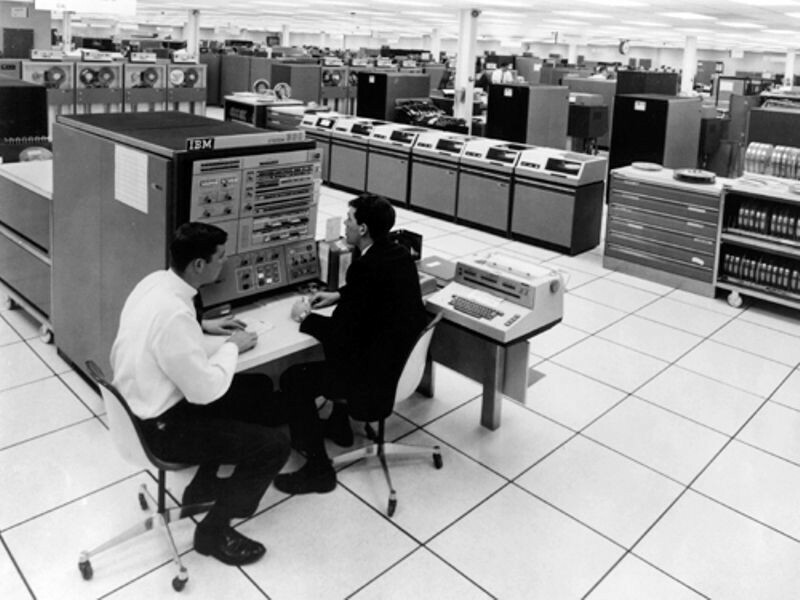 Running on dual IBM 7090 mainframes, SABRE was inspired by IBM’s work on the SAGE air-defense system. SABRE, which became a separate travel-services company in 2000, owns the Travelocity website. Computer dating begins in earnest with Project TACT (Technical Automated Compatibility Testing). While students at Harvard had created dating programs, and television shows used computer matching as a gimmick, Project TACT was an ongoing service that initially matched residents of New York's Upper East Side. 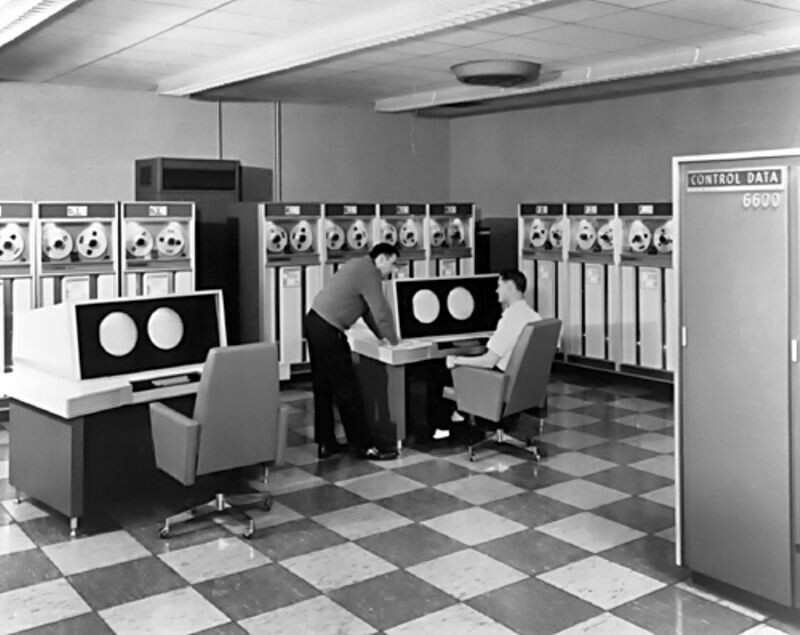 Accountant Lewis Altfest, inspired by a visit to the Parker Pen Pavilion at the 1964 World's Fair, brought in programmer Robert Ross to help design a system to match singles. Participants would fill out a questionnaire. 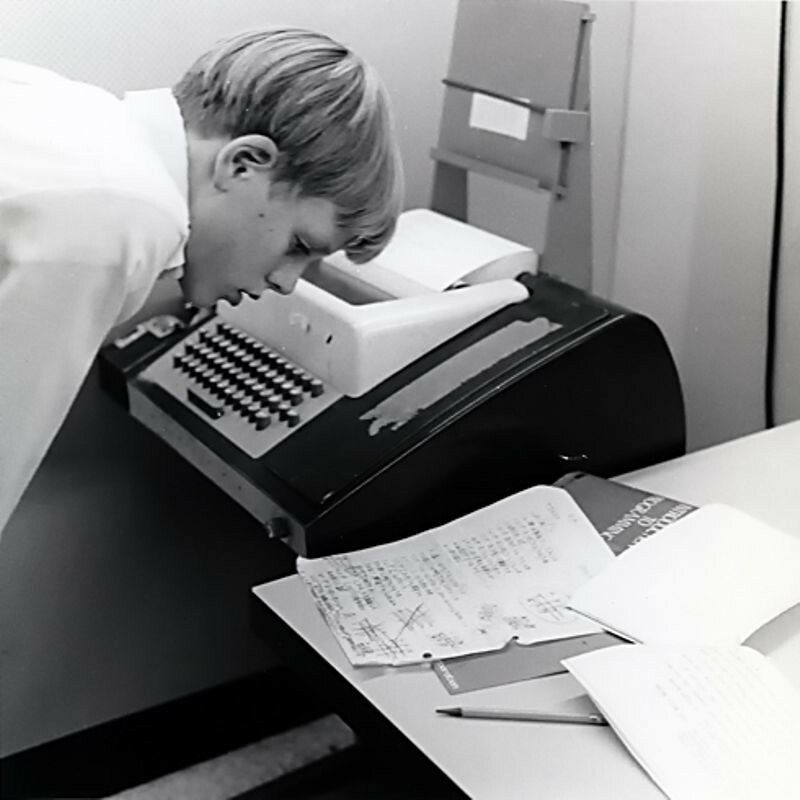 The answers were then transferred to punched cards and fed into an IBM 1401 computer. After processing, each participant would receive 5 punched cards – blue to indicate male matches, pink for female matches. Though the business received a large amount of early media coverage, and expanded to all of New York, Project TACT lasted only a couple of years, ceasing operations when its founders lost interest. SABRE is a joint project between American Airlines and IBM. 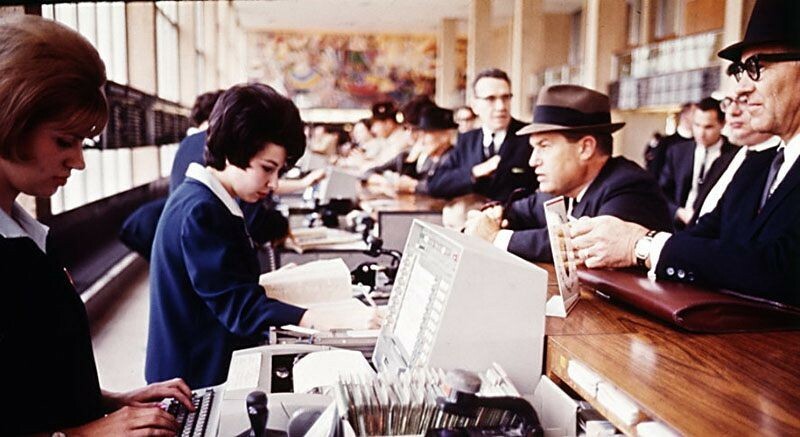 Operational by 1964, it was not the first computerized reservation system, but it was well publicized and became very influential. 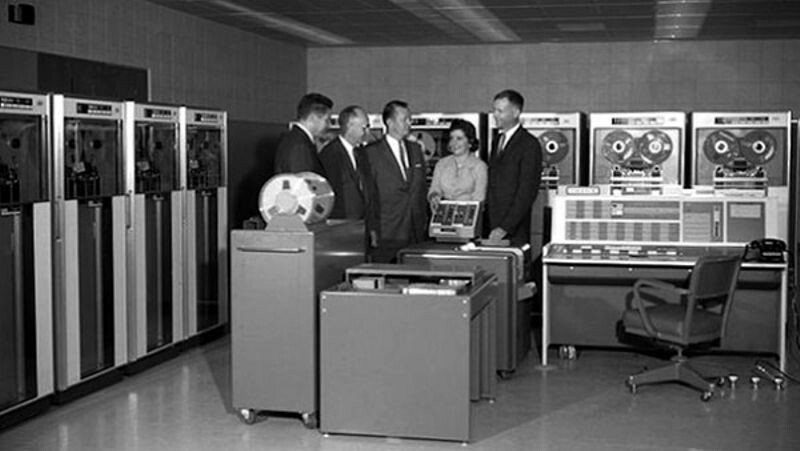 Running on dual IBM 7090 mainframe computer systems, SABRE was inspired by IBM’s earlier work on the SAGE air-defense system. 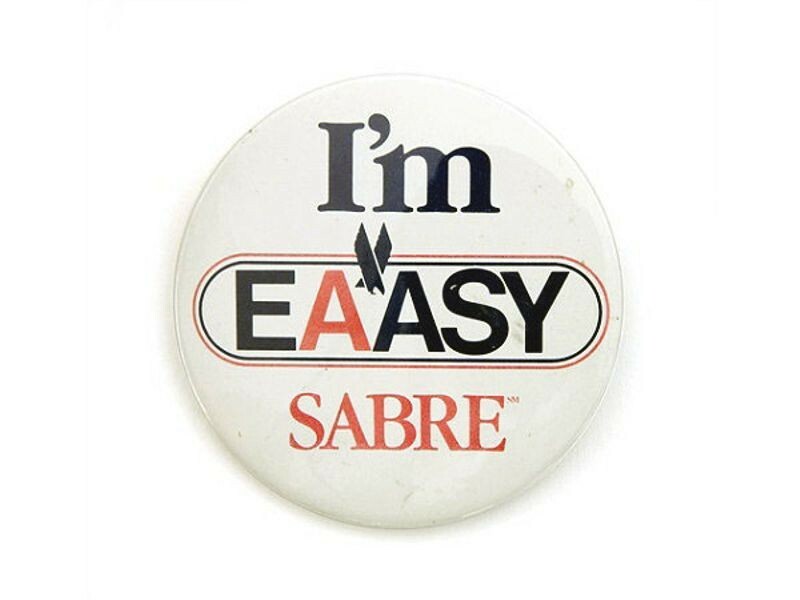 Eventually, SABRE expanded, even making airline reservations available via on-line services such as CompuServe, Genie, and America Online. At a cost to computer makers of roughly $700, the ASR-33 Teletype is originally designed as a low cost terminal for the Western Union communications network. Throughout the 1960s and ‘70s, the ASR-33 was a popular and inexpensive choice of input and output device for minicomputers and many of the first generation of microcomputers. IBM introduces Transformer Read Only Storage (TROS) with the arrival of the IBM 360. 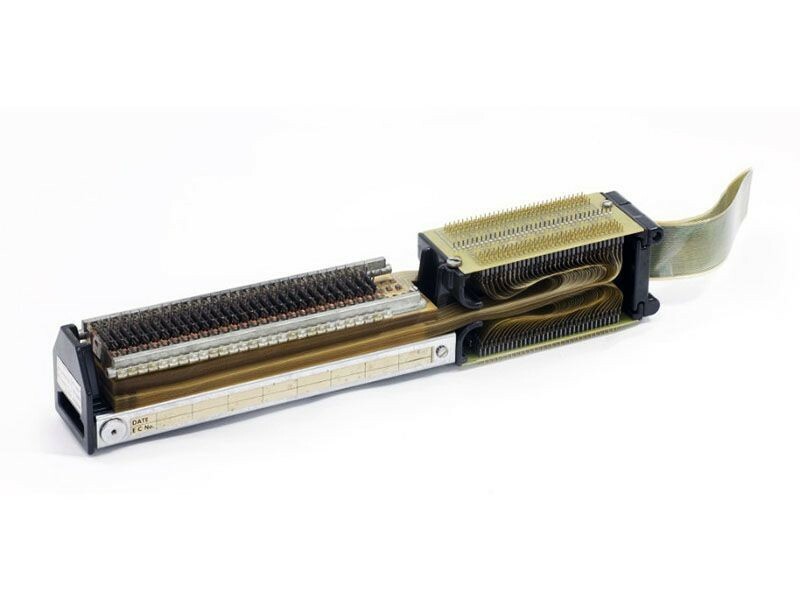 TROS modules preceded solid-state ROM chips, and each bit of this read-only memory for microcode was a little magnetic transformer. Punches in the mylar strips controlled whether current flowed through the transformer or around it, representing a binary zero or a one.